sample paints in all my favorite colors! I just about bought one of each! 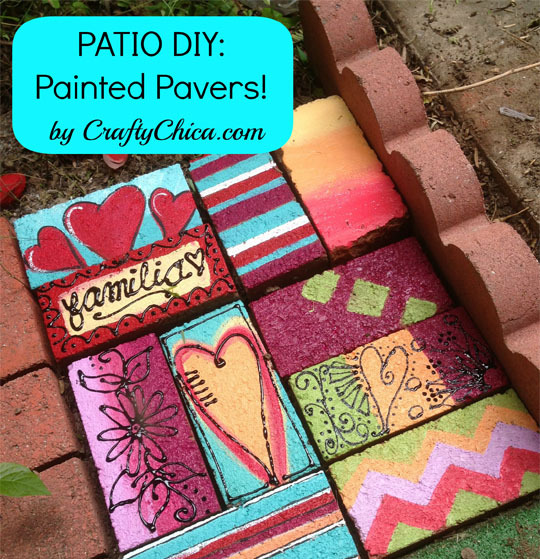 I knew exactly what to use them on – the pavers! Here is my inspiration – many years ago in our first house, we were renters. We couldn’t do much to makeover the place, but I noticed the front yard had these giant rocks in the flower bed. I, um, painted all of them in cheery hues! I found out just a few months ago that the people now renting the house love the rocks, they are still there – even through all those other renters after us! So I decided to add a bit of that same colorful spirit to our own flower bed in the front porch area! You can buy bricks or pavers at Lowe’s for super cheap. Sketch your design with a pencil and have fun painting. My suggestion is to map out the design before you start painting so it will have balance in design and color. Once you’re done with all of them, give them a thick coat of outdoor varnish so they’ll last a long time. I would try not to keep them in direct sunlight or they’ll fade. TIP: Use black Puffy Paint to outline – it will really make your designs POP! You can see I still have a ways to go, but I love how it’s looking already! Color is magical! Next ArticleHispanicize 2013: Wrap Up! What a fun idea! Color outside yes, you could paint them in the winter, and put them out in the summer. 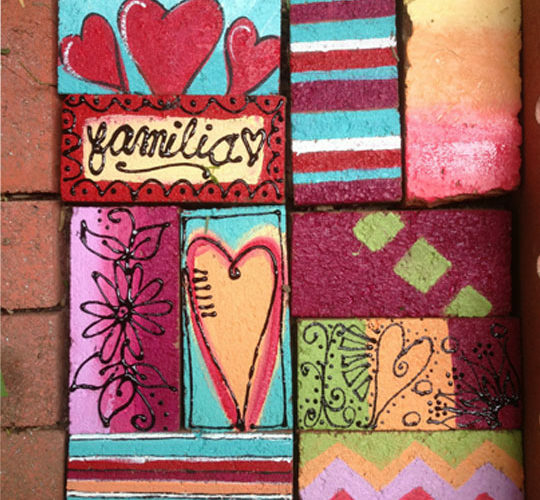 did you clean and sand the bricks and what did you use to put the designs on. So, if one covers one’s work with varnish, does it matter what kind of paint is used?? 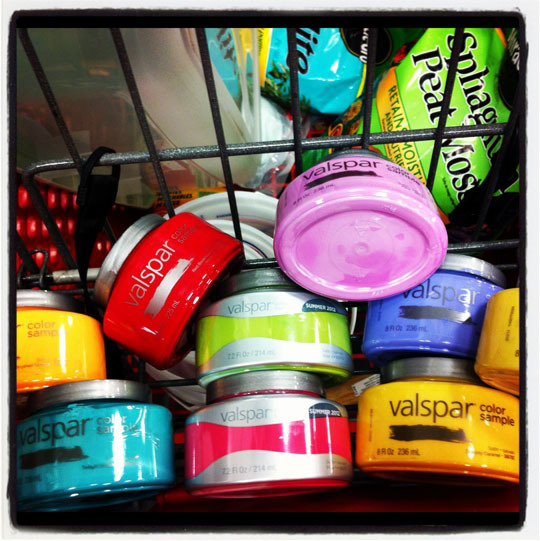 Could one use the tube acrylic in one’s stash – or is the house paint better? I have lots of left over paint……thanks for the idea……. 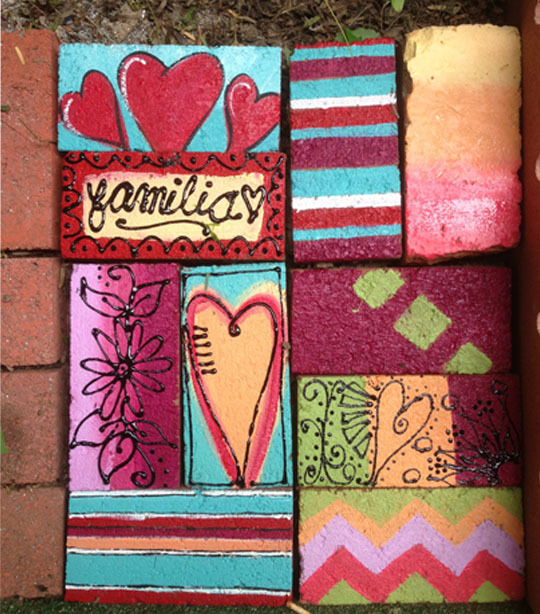 Love love love the colors for the courtyard garden at the library – the storytime children could each paint two pavers – 1 to go home and 1 to decorate the garden. Messy, I bet, but oh what fun! Mahalo for sharing. 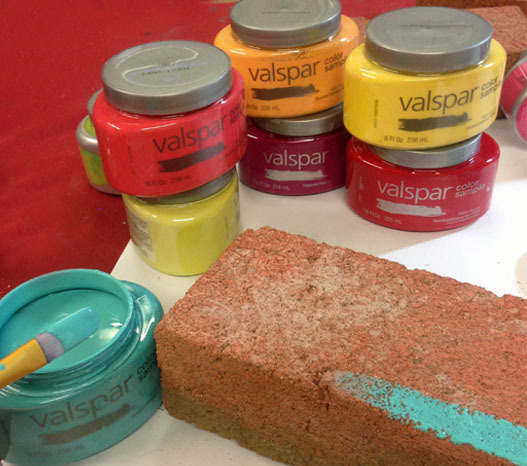 How did you clean the bricks and what did you use to put the designs on. Thanks. Where can I buy shaped bricks for Snowmen or Gingerbread men? Sorry but to withstand weather extremes, your paint is not going to work. Your best bet would be to use exterior latex that you tint with the desired color. I know that you can use any brand of paint tint that can be found throughout paint and craft retailers. I have even tinted exterior white paint with the bottles if acrylic sold at Michaels for 99 cents-to cover with sealer, i would search the most waterproof/weatherproof option or else your hard work will be for nothing. Been there, done that with these pavers. 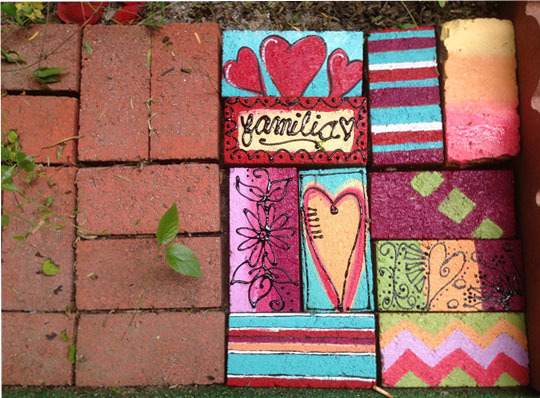 I did this post years ago and my pavers and bricks are holding up beautifully! I’ll gladly post a current picture!